Getting new tires spurred me to bring my RV maintenance records up to date. Since I bought it in March 2014, I've put 10, 218 miles on the rig. I've spent $3345.82 on gas, and $11,690 on repairs and maintenance. I think -- I hope -- that annual repair/maintenance expenses won't continue at this rate. It's interesting that the fuel cost is so much less than the maintenance. I've now gone through all the big-ticket items on my mechanic's to-do list. Maybe the rest of this year I can just put gas in it and go places. Heh heh. Couldn't resist the pun. Faithful readers will recall that when Buck replaced the ball joints, he sent me off to get the front end aligned and the tires rotated; there was some visible uneven tire wear at that point. The guys who aligned the front end weren't able to do the rotation, and today I took it in to have that done by way of preparation for summer travel to come. Keep in mind that your friendly local Discount Tire isn't able to handle this kind of job. 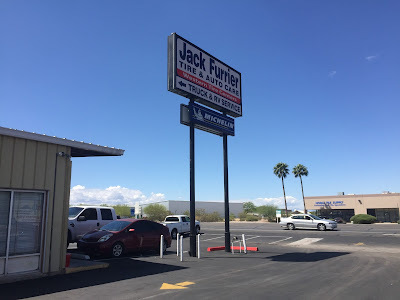 So off I went across the city to the commercial/RV Jack Furrier shop. Yes, there was uneven wear. And some cracking on the sidewalls. Of the six tires, three or four were ready for replacement. So I took a deep breath, clutched my VISA card, and went for it. The Michelins were top line tires. The next least expensive was only $10 cheaper. 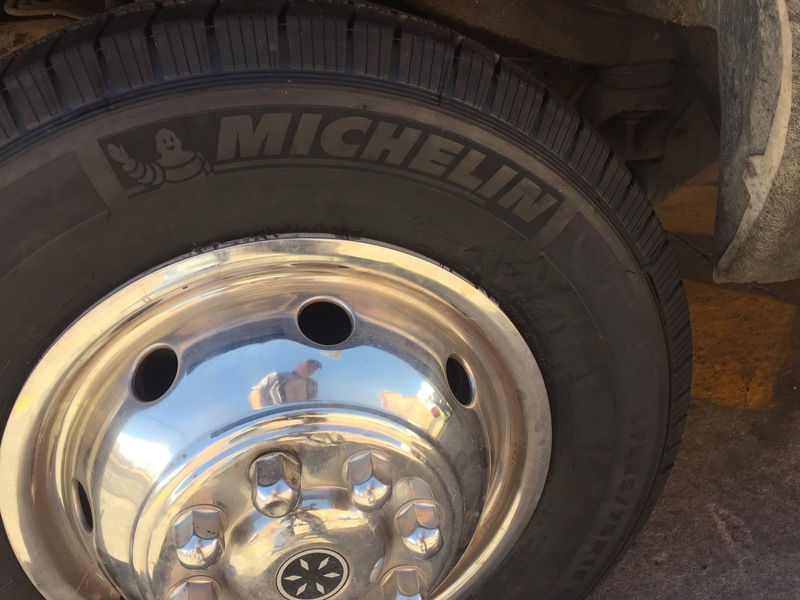 The tires I replaced were 4 years old. There's a rough consensus that in this part of the country, 5 years is about as much as you can expect. (Like 3 years for a battery.) So here I am. 6 new paws. Lots of money, but I do feel better knowing that I have super-good tires. One of my recurring concerns has been being out in the boondocks, in the rain, in the dark, trying to change one of these very heavy tires. I'd like to think that's less likely now. Now back to replacing old dried-out caulk, window valances, and marker lights. I've just about finished the plans for a trip which will take up a lot of the month of May. 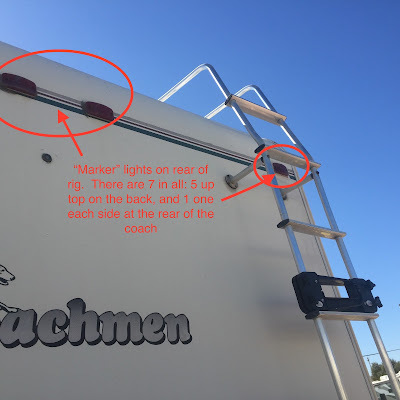 I want to talk about planning, and about what I'm learning about how to structure an enjoyable RV trip. Here's some of what I've learned. What I'm not doing is wandering about the countryside, footloose and fancy free. I've never been a footloose and fancy free kind of guy, even traveling on foot in the mountains. 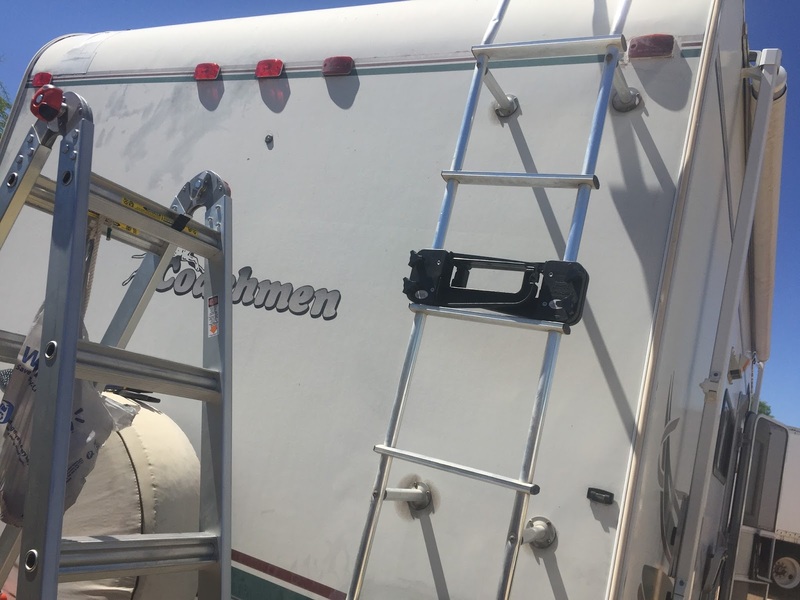 This trip is a mixture of boondocking, camping with utilities, and some time with friends at their house in New Mexico. I really like being reasonably certain that there will be a place to stay at the end of the day. 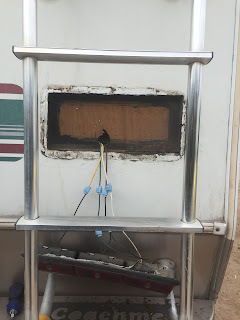 I'm set up for dry camping, but I also really like having electricity and internet/phone connections. I like short driving days: A couple hundred miles or so seems about right. Based on last summer, I seem to be good for 2-3 weeks away from home. I'd like to push that boundary. For example: next trip, in the June/July time frame, I'd like to get further north: last year I had my eye on Wyoming and Montana, but didn't get there, for various reasons. If I'm always returning to home, which is pretty close to the Mexican border, and I'd like to explore up near the Canadian border, that's a lot of time and gasoline just getting in the neighborhood. One way to do this is to drive longer days and overnight in a lot of Walmart parking lots. There's another thing: driving through cities. Hate it. And the main problem is visibility on the R when making lane changes. I'm looking into a new rear-view camera, or re-positioning the one I've got. The territory I want to explore is mostly in the "U" from Salt Lake City to Denver. It's 780 miles to get to the SLC vicinity. Roughly 550 miles from there up to Billings, another 550 from Billings to Denver. And 900+ from Denver home. This needs thought. So I looked at the others (there are 7 all told) and they were all in pretty bad shape: cracked, and in some cases with holes where the plastic had just fallen away. I'm assuming that this is the result of sitting out in the sun for 16 years. I ordered a bunch of them from Amazon, and decided to tackle the two at eye level first, just to get the hang of it. I thought I was going to install these two in about an hour or less, and then go back to the continuing project of replacing interior window valances. Hah! Turns out I had ordered the right replacement fixtures. Yay me! So I took off the one on the right side, and snipped the wires leading back into the body of the rig. I momentarily let go of one of the wires, and it obligingly slips down out of sight into the belly of the Beast. Bad words were heard in the parking lot. 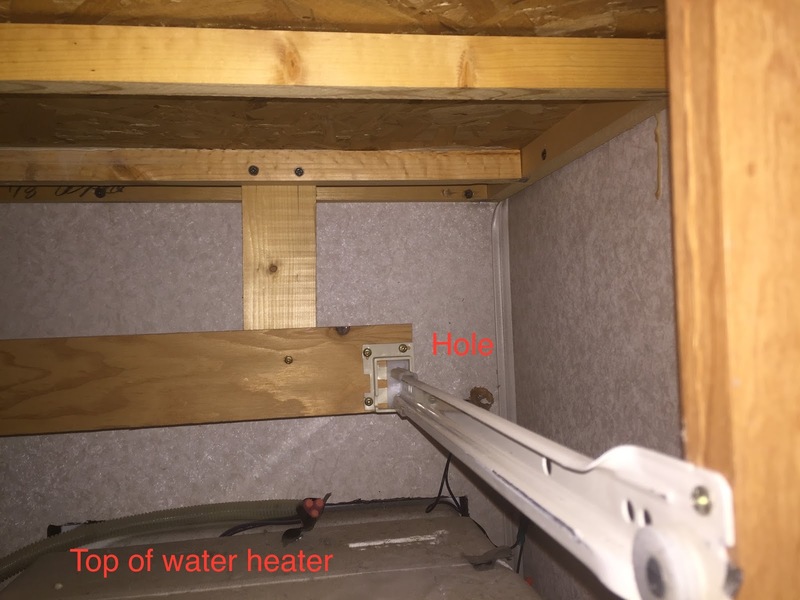 I hoped maybe the wire that had slipped away was the ground, and I could find some other place to run a ground wire from. No joy. I got out the wiring diagrams, and the marker lights turn out to run off the same circuit as the chassis running lights. Cool. Attach various wires, check to make sure it lights up when it should, and done! 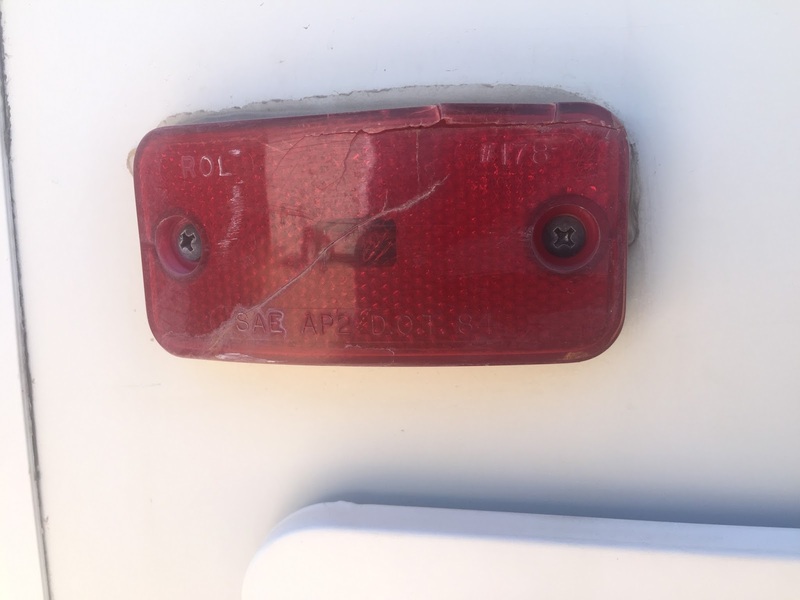 I had left the butyl sealing tape in the refrigerator at home, so I couldn’t put the tail light assembly back in place for good. It was supposed to rain, so I taped the assembly in place with gorilla tape. The left-side marker light replacement took all of 20 minutes, if that. The key sentence in this story is "I took a deep breath (this is scary stuff for me)…” It’s pretty simple, and I did a good job of figuring out what to do to fix the result of my clumsiness. But this kind of work is not my forte: as I’ve said over and over, I’m a software guy. A clumsy software guy. The light on the far right of the picture above was the last one. It's a fact in the world of mountaineering that most bad accidents happen on the descent, when people are tired and the emotional rush of the summit has worn off. By the time I got to the last one I was tired. And just a little inattentive. I dropped a screw, which disappeared into the dirt. The replacement I found wasn't just the right size, and I cracked the plastic housing. Sigh. I'll tell you more about the new window valances real soon now. Here's another very similar plan. The northernmost spot is a NM State Park near Farmington: Navajo Lake. Big park, lots of spaces. Nice setting from the looks of it. The route to Willow Springs might be reworked to avoid going through PHX. This has me putting in about 200 miles per day, total miles about 1300. $350- $400 in gas. Dry camping at Willow Springs, Gallup, and Valley of Fires. Possible stopover at Bisti Badlands near Farmington. I'd maybe stay at Willow Springs, the Dine casino at Gallup, BLM land in /near the Bisti Badlands, visit my friends in White Rock, the BLM campsite at Valley of Fires, Rockhound, and home. Globe shows up on the map because I wanted the route to Willow Springs to go that way. Reasonable driving distance each day. Just thinking... I don't have a time from for this. Other than Willow Springs, it sure doesn't satisfy my desire for greenery. I've actually been home for a while now. I've been bad about keeping this up to date, and I'll try to do better, so y'all don't lose sleep wondering where I am. I stayed at Rockhound for several days. First night was reserved, with electric. Next few were "dry," in a gorgeous spot about as high up in the campground as you can get. When I was there, the wind came up. Steady winds in the 40 mph range, gusts to 50-60. It blew up dust, and at times the view down across the valley was completely obscured. It wasn't one of the "haboob" style dust storms that frequent the Phoenix area, it was just plain blowing dust. The rig rocked. It blew my little solar panel across the "yard." No apparent harm done. Thanks, Renogy! And something in the rig made a clanking noise when it gusted. Turns out that noise was from a partially-severed rear mudflap. At any rate, the wind was a real presence. Reminded me of the last time I spent time in a tent in a snowstorm, except I wasn't worried the rig would blow away. And I wasn't camped on a glacier at 10,000 feet elevation on Mt. Rainier. While I was at Rockhound, I talked with a couple of guys whose general situation in life has some similarities to mine. One I've written about before: the Navy vet with the big white dog named Moose. The other is is a former mechanic from the Taos area. Both are now living on the road full time: one in a nice little recent-model Casita travel trailer with a Tahoe truck; the other in a 1970's motorhome the likes of which I'd never seen before. They both walk with some difficulty, using a walking stick of some kind. As I do, unless it's a very short walk and/or my pride doesn't get the better of me. They both had been very active in ways which their bodies won't support any more. And so, like me, RV travel and camping is one of the few ways to be in or near the outdoors that they had loved. Now, I'm not "fulltiming" and not likely to. I'm lucky that I can afford so far to maintain a home here in Tucson and spend time on the road when I feel like it. I have the feeling that the Taos guy, in particular, is living pretty close to the edge. But it occurred to me: if he's as strapped as I think he is, he's probably got some equivalent of food stamps. He's got the skills to fix problems in his rig. As a New Mexico resident, he gets an annual camping permit, if he's disabled, and he displays the universal blue "handicapped tag," for $100. And then he can camp at state parks for free, as long as he moves every 2 weeks. It's not a bad way to eke out a living on not much money. Both of these guys had been alternating between Rockhound and a nearby NM state park called "Pancho Villa," less than an hour to the south right on the international border. So I decided that, rather than staying put at Rockhound, I'd spend a night or so at Pancho Villa before turning westward to home and Tucson. A previous reviewer referred to this as an "odd" little park. That's being polite. It's dusty, unattractive, confusingly laid-out, poorly signed, poorly maintained. There's some sad-looking museum exhibits which portray the relatively unimportant skirmish between the man who called himself Pancho Villa and American General "Black Jack" Pershing. If you're a history buff, this might appeal to you. It's easy to find the park once you're in Columbus. Follow signs. If you have a New Mexico annual camping permit the place is dirt cheap. Pun intended. The main reason to visit Columbus, NM, seems to be a convenient border crossing into Mexico for low-cost prescription drugs and dental work. Other than that, there's not much reason to stay here. I have met full-time RV'ers who shuttle back and forth in 2-week intervals between this park and Rockhound, about an hour north. Rockhound is a delight: well-maintained and attractive. This place is neither. ATT cell service is by way of Mexico, so be sure to put your phone in airplane mode if you don't want very expensive roaming charges. ATT Signal strength seemed adequate. Didn't test Verizon. Disclosure: I drove in, found the camp host (no mean feat!) got a map (whose relationship to the territory seemed tenuous) poked around, and left. I didn't actually stay here. So I considered my options and headed home along NM route 9, where Border Patrol vehicles were thick on the ground and turkey vultures feasted on road-kill opossum.